Welcome to Thailand's Golden Triangle region, where entrepreneur Blake Dinkin is producing fantastically aromatic coffee from excrement. Canadian entrepreneur Blake Dinkin has spent 10 years and his life savings on making something extremely unorthodox: coffee harvested from elephant excrement. Working in Thailand’s Golden Triangle—a region that has long been one of Asia’s most extensive opium-producing areas—Dinkin sources top-notch Arabica coffee beans from the hill tribes in northern Thailand (near the border with Myanmar), mashes them with fruit, and feeds them to the elephants. After the elephants, eh, produce, he and his team carefully pick the beans out, and lather and rinse them. This is a tedious, low-yield process: 33 pounds of coffee beans make only one pound of Black Ivory Coffee. As disturbing as it may seem, Dinkin’s Black Ivory Coffee is a product of extraordinary labor and miraculous conception. 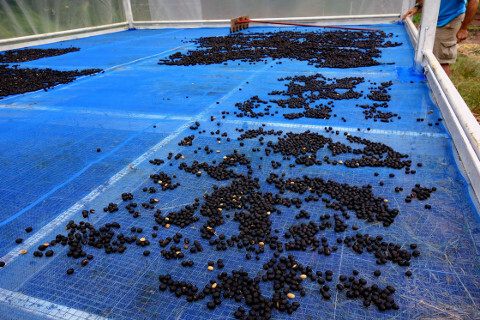 By fermenting the beans in their stomachs, the elephants break down and remove most, if not all, of the coffee’s bitterness. John Roberts, director of the Golden Triangle Asian Elephant Foundation, has no problem with having the elephants help out with coffee production. “As long as we could prove that there was no caffeine or anything else harmful leaking out, then it was worth trying, at least,” he said. According to the report, Dinkin is not looking to make bank on a mass commodity just yet—for now, he just wants to sell an experience. 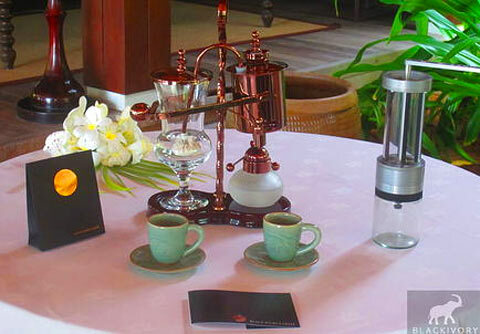 Black Ivory Coffee is currently available at five-star hotels and resorts in Asia and the Middle East, and at The Elephant Story, a small store in Comfort, Texas that donates profits to elephant conservation. For all its decadence, we hope that Black Ivory tastes better than the civet (or Asian tropical cat) poop coffee, “Kopi Luwak,” the pioneer of all poop coffees.